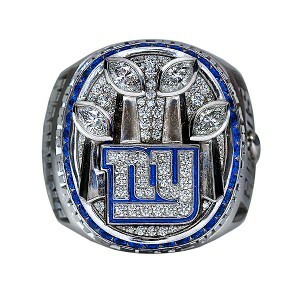 Giants receive their Super Bowl XLVI rings! The New York Giants unveiled their Super Bowl XLVI ring Wednesday, which also pays homage to all four of the franchise's championship teams. "We wanted it to represent the four trophies and have that feeling that you made the best ring that you could have made," defensive end Justin Tuck said in a statement released by the team. "I think we captured that." 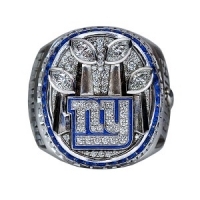 The ring, made of white gold, was designed by Tiffany & Co., which received input from Giants ownership, general manager Jerry Reese, coach Tom Coughlin and Giants captains Eli Manning, Tuck and Zak DeOssie, who also received input from other players on the team. The ring is covered in diamonds and has four Vince Lombardi Trophies, commemorating the team's four titles. Each trophy is set with a marquis diamond representing a football. The Giants' logo is surrounded by the trophies and is set with diamonds. The top of the ring includes 37 blue sapphires. The ring also has some blue coloring, which was important for the players involved in the design process. The ring the team received after its 2007 title featured white gold and diamonds, without any additional color. "The blue makes it a little different," Manning said in the statement. "We wanted some blue -- the Giants are Big Blue. We definitely wanted to get a little blue to spark it up a little bit." Also included on the ring is the final score -- 21-17 -- of the Giants' victory over the New England Patriots, plus the years of the team's four titles (1986, 1990, 2007 and 2011). "Our thing now is we want to be a dynasty," Tuck said at the Giants' ring ceremony at Tiffany & Co. on Wednesday night. "We want to make it a dynasty." "I think the second ring makes you that much more hungrier," Tuck added. "Because you get there the first time, you are in awe. You are like, 'Oh God, this might not ever happen again.' And then you win a second one, and you are like, 'Hey, maybe we can do something here.' "
The ring also has the words "Finish" and "All in" engraved inside the ring. The words were inspirational phrases the team used during the 2011 season. "It means everything to me," coach Tom Coughlin said when asked about the word "finish." "The word finish in there really captures a lot of emotion for me and a lot of focus that we took from Day One in camp after what was obviously not a very pleasant offseason. But the fact that our players can quote to you what this means to them and how they were reinforced by this over and over, I think that says a lot. I'll always look upon that." Some Giants said the ring reminded them about all the hard work they put in to turn around their season last year and how much work it will take to repeat. And several Giants said they want another ring now that they know what it takes to win one. "This is a great piece of hardware on our hand right now, but we can always have more rings," Antrel Rolle said. "Just ask Michael Jordan." Defensive end Jason Pierre-Paul concurred. "Don't nobody want [just] one," Pierre-Paul said. "Most people don't have one, so it's a blessing that I could get one and the whole team got one." Several former Giants who no longer are with the team made it into the city for the event. Raiders defensive end Dave Tollefson, Bears wide receiver Devin Thomas, Redskins linebacker Jonathan Goff and free-agent right tackle Kareem McKenzie were among those who attended the event. Victor Cruz said the ring always will be a symbol of the hard work the Giants and he put into last season's magical run. "You know all the hard work is paying off, and it's finally coming full circle, everything I've been through, and this is kind of the icing on the cake," Cruz said. "I want to win another one. I'm young. So I figure we won one this early in my career, why not get a couple more?" Manning, in an interview Wednesday morning with CNN, said he doesn't wear his 2007 ring much. "I kind of wear it on special occasions up to the start of the season, then I put it away," Manning told CNN on Wednesday. "It's a big ring. It's almost hard to wear."